The straight razor shave is the odds-on favorite to give you the closest, smoothest shave you can get. But what can a man in Tucson, AZ do to take advantage of this luxury? We have outlined the steps to get the best straight edge shave possible. Are You Ready for a Straight Razor Shave? A straight edge shave will take time, technique, and plenty of patience. (If you do not have the time to do it properly, you are better off letting II Sons For Men, your local Tucson straight razor barbershop, take care of it for you, but if you want to learn, just keep on reading below). A straight razor shave takes more time than a cartridge shave or a shave with an electric razor. And you can certainly not do it on your commute in your car. There is prep work before the shave and proper care that you need to do after the save to ensure that you shave correctly and do not set your self up with nicks, bumps, or general irritation after. You will want to select a straight razor that feels comfortable in your hand. It should not feel bulky and it should feel like a natural extension of your hand. The most important thing is the weight of the straight edge. 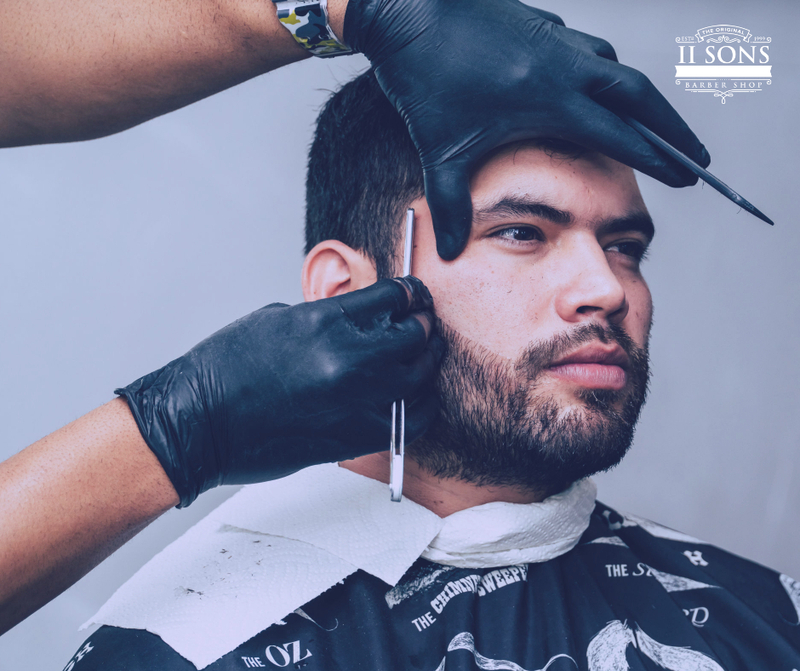 You will need to apply more pressure with a lighter weight than with a heavier weight to get the close shave that you desire. After you pick your blade, you will want to test it out make sure that you are using it properly. You want soft skin and open pores prior to shaving with a straight razor. You do not want razor burn. We have found that the best way to prep your skin before the shave at home is with a hot shower. This opens the pores and ensures that they are clean an clear. And it is why we use a hot towel in the barbershop to replicate that effect. The heat will not only open the pores, but it will make your hair softer and easier to cut. After you will want to apply your preshave oil and shave gel. You will want to hold the blade at a 30-degree angle from your face. Who said you would never use math again after school? Holding the blade too flat against the skin will rip and not cut the hair stubble and holding the blade too steeply will leave you with cut up skin. You will want a firm grip. And you will want to make sure your skin is tight. You will do that by pulling your skin with your free hand or by stretching. Apply a gentle touch with the blade. Pick a side. Start at the midpoint of your ear, moving down with short even movements. Make the cuts short, rinsing the blade in hot water before continuing. Keep your skin tight at all times. Pointed parts of your face such as the chin or jawbone require additional and unique care. You get close to the chin, lift you blade slightly and use the blades middle instead of the edge. This will give you even more control as you navigate this part of your face. As you go over your chin use lighter strokes. For your upper lip, you will want to imagine that it is broken up into 3 parts. You will do either side in the same way that you shaved your cheek, using short steady strokes. To ensure that you have the flattest skin possible while you are shaving your upper lip, you will want to pull the opposite side tight. This will give you the best shave possible. For the center of your upper lip, you will want gentle strokes, holding up your nose to give you the tightest skin possible in the center. Move your mouth, making the skin under your lip is tight and wide as possible. Take the blade from the corner of your mouth, across your skin, to the middle of your chin. Take care of any remaining hair with short upward cuts. Following the outline under your lips take the blade upward. For your neck, you will want to follow the grain of your hair growth. This will help you avoid cuts and reduce the chance of skin irritation. The whole point was to have the smoothest shave possible, but if you are reading this guide, you really don’t know what you are doing yet. You will probably have to do another run through, but on the second time around, you will want to shave against the grain of your face. Add lather or gel to reapply your cushion or if you splashed yourself with hot water before beginning your inspection period. Always ensure you have a cushion before applying the blade to your skin. Shaving with a straight razor is not something that you would ever want to do dry. a soft cloth. You want to make sure that you store it somewhere where it will stay dry and dark so do not keep in a place where it will be constantly hit by the humidity of your shower. If you will not use your straight razor again for awhile, get some blade oil. Rub the oil all over the blade before putting it up for storage. The oil will prevent the moisture in the air from rusting your blade. If for some reason, you follow all of our advice and you still end up with a rusty blade, do not use it again. Replace your rusty straight edge blade. You NEVER want to shave with a rusty blade. Just trust us on that one. These are the 8 steps for getting the best shave possible with a straight razor. There is nothing quite like getting one. We know that there is a long and lengthy process to it but we think it is worth it (and that is not because we have perfected the process). If you want the benefit of a straight razor shave, but do not have the time or the patience to do it, just schedule an appointment with one of our barbers here at II Sons For Men. We are all well versed in the art of the straight razor shave and we would love to take care of you today. To book your best Tucson straight razor shave, just click here.